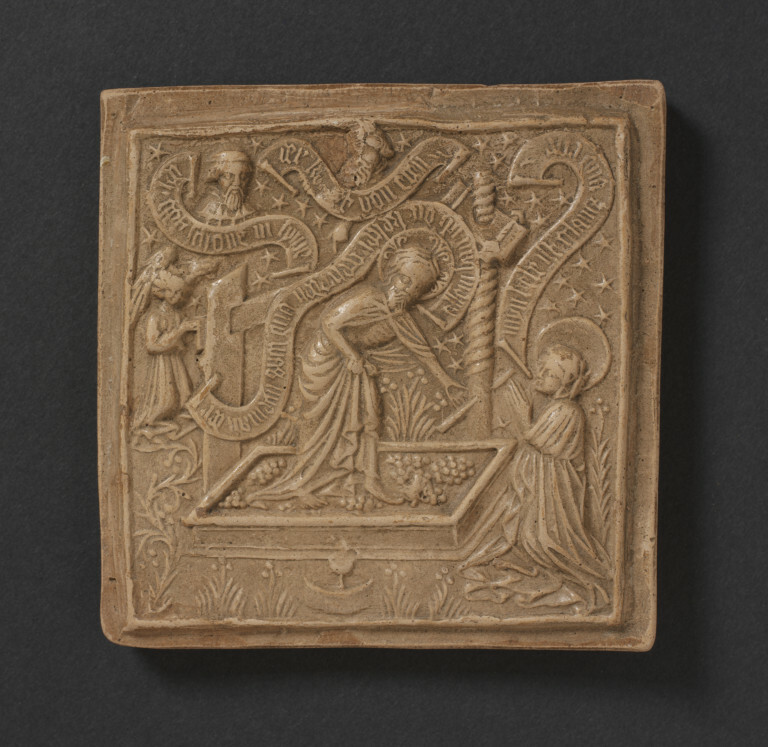 Moulds such as this were primarily used for making pastries for the special feast days of the Christian year, but were also used to make cheap metal reliefs to serve as pilgrimage badges and for decorating bells and mortars in bronze foundries. This one shows Christ in the wine press, a common theme in German art at this period. Christ treading the grapes alone was a motif from the Old Testament book of Isaiah, which prefigured the death of Christ in the New Testament. The grape juice flowing into the chalice represents Christ's blood poured out as a sacrifice for mankind at the Crucifixion and the belief that during the celebration of the Mass, the wine served in the chalice becomes Christ's blood. The mould depicts Christ in the wine press with the inscription on a scroll: "allein han ich die kelter getreden und was nyeman der [hülfe]"; [ I have trodden the wine press alone there was no one there [to help] (Isaiah 63.3). The Virgin kneels before him with clasped hands and the inscription: "myn liebe ist glancz und rot" [my love is brilliant and red; (Song of Songs 5.10)], while a winged angel holds the beam of the wine press on the other side. Above the wine press in the centre and on the right side appear two bearded heads, probably representing St John the Baptist (centre) and probably a prophet (right side), with inscriptions. On the right: "der get schone in syme [Eigen]" [He came to what was his own]; John 1.11], and in the centre: "der komet von oben" [he comes from above; John 3.31, the words of St John the Baptist when asked by the Jews about Christ]. As this is a mould the lettering of all the inscriptions is reversed; for a positive impression see the plaster cast photograph alongside (inv. no. C.329A-1926). The juice from the grapes flows into a chalice which stands in a dish in front of the wine press. The upper and lower right edges and the bearded head in the centre are slightly damaged. Historical significance: The prototype for these terracotta moulds was probably made in metal or Solnhofen limestone by a die-sinker. Similar items are listed in the inventory of the patrician and merchant Claus Stalburg (1496-1524). Stalburg describes them as "kuchelstein, so ich mir selbst hab lassen graben und hat sie gemacht Hartmann Kistener, meyner hern guardin" (I commissioned pastry-moulds for myself from Hartmann Kistener, the master of the mint) (Arens 1971, p. 107). These moulds were disseminated in terracotta for wider use. 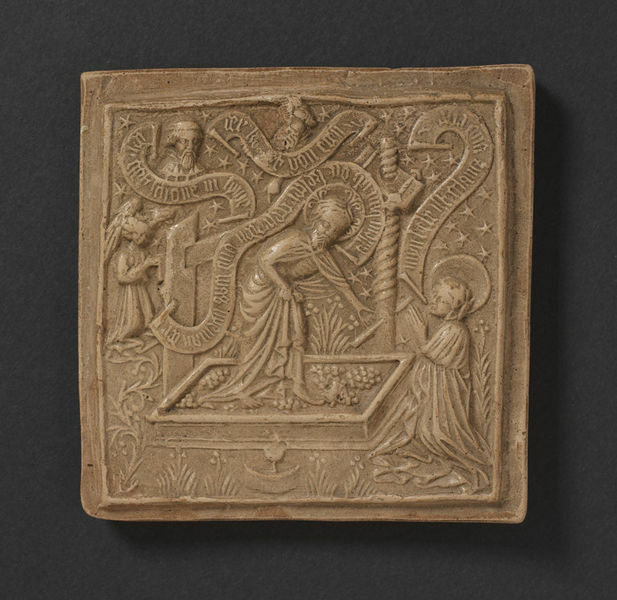 The primary function of the metal, Solnhofen limestone, and terracottas respectively was to serve as pastry-moulds for feast days during the year. The moulds were also used to make pilgrimage badges, and in bronze foundries to decorate bells and mortars (Arens 1971, pp.109-110). 1. Berlin, Kunstgewerbemuseum, inv. no. 86165, h. 10.2cm, w.10.1cm, d. 0.8cm. Bought in 1886 from Robert Reinecke, Hildesheim. (Bode/Volbach 1918, p.129,no. 39. Arens 1971, p.121). of Hirsau. (Fehring 1970, p.83, fig.30. Arens 1971, p.121). 3. Hamburg, Museum für Kunst und Gewerbe, inv. no. 1922.101. Fragment, h. 10.3cm w. 5.6cm to 6.9cm, d. 1.5cm. (Unpublished). 4. Kahl am Main, formerly in the possession of the Catholic church, now missing, h. 9cm; w. 9cm. (Arens 1971, p.121). 5. Cast on a bronze bell, dated 1540 in Bisperode (Bode/Volbach 1918, p.103, fig. 11). The moulds have been dated to about 1450 since the article of Bode/Volbach in 1918, and a Middle Rhenish origin has been suggested. Arens (1971, p.121) mentioned the existence of a fifteenth-century wall painting of Dietersheim near Bingen of the same subject, now in the Mittelrheinisches Landesmuseum, Mainz (Glatz 1979, p.92, pl. 39b), reinforcing a Middle Rhenish origin. 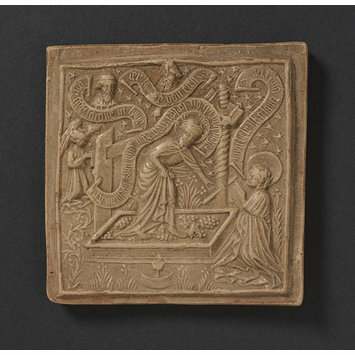 Positive impression from ceramic mould C.329-1926 depicting Christ in the vineyard. Depicting Christ in the wine press, Rhineland, Germany, about 1450. Exh. London 2000, pp.186-87, no. 73.